Evelyn captured the history and spirit of early Montana with over 1800 photographs and 35 volumes of diaries. The daughter of a wealthy English family, she turned away from a genteel lifestyle to adopt the life of a Montana rancher. To make ends meet she turned to photography. 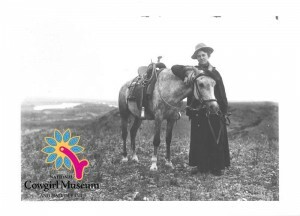 While selling the pictures helped her financially, her images of the rugged landscape, and her recording of the cattle and ranching tasks with almost daily written notations preserve a true impression of American frontier life.